On August 5, the second leg of the Champions League third qualifying round took place. Shakhtar faced Fenerbahce in Lviv. The first game in Istanbul saw the teams play out a 0-0 draw. In the second leg, the Pitmen’s head coach Mircea Lucescu fielded the same line-up as the week earlier. Fenerbahce’s coach made two changes: Sener started at right back, and Meireles was deployed as a holder. Also, van Persie and Kadlec, who came to Lviv with their team, were included in the visitors’ match squad. The venue was packed this evening, Shakhtar played their milestone 100th game in the Champions League. As early as in the first minute, the Pitmen could have scored. Marlos came inside the penalty area to struck a shot from towards a corner with his left foot – the ball went out for a corner. 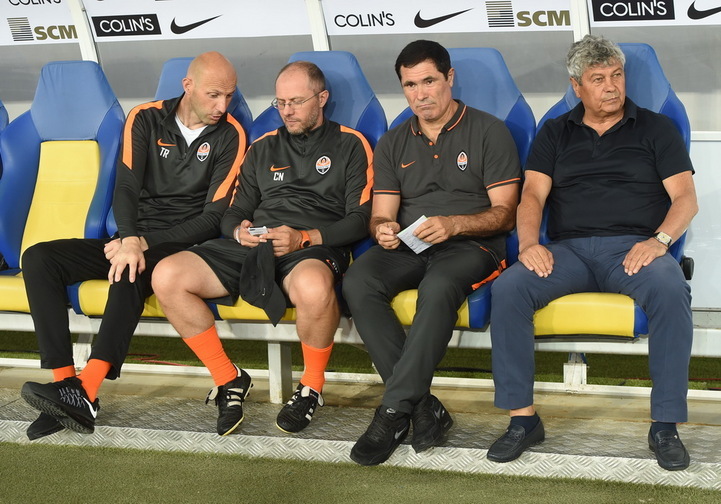 After some tine the Pitmen’s attack down the left flank also proved to be very dangerous: Vyacheslav Shevchuk drilled a cross into the penalty area, the ball bounced to Gladkyy, who fed Alex Teixeira being in a difficult situation – the opposition goalkeeper stopped the ball at the goal line. Yaroslav Rakytskyy fired a long range shot – just wide of the goalpost. The Pitmen’s goalkeeper Andriy Pyatov made his first save in the 19th minute following a shot towards the far corner from Bruno Alves. In the closing stages of the first half, Pyatov came to rescue his team, after Sow headed the ball goal wards from close range. By that time, Shakhtar were already in front. On 25 minutes, the Pitmen’s attacking move resulted in Taison feeding Darijo, who drilled a cross to the near post for Gladkyy to make it 1-0 with a first time shot. After the half time break the visitors started playing more energetically, creating two very dangerous chances. Pyatov made a wonder save, parrying away a vicious shot from Nani’s free kick and deflection of Sow’s head. In the second episode, Alves missed the target, heading the ball from close range. On 61 minutes, Fenerbahce’s head coach Vitor Pereira did not treat Fred in a sporting manner after a pause in the game, and the referee sent off the opposition head coach. Soon Shakhtar managed to extend their lead. Marlos picked up speed on the right flank to skip past two opponents, darted into the penalty area only to be brought down by the opposition goalkeeper. The Pitmen’s captain Darijo Srna confidently converted the spot kick – 2-0. It happened in the 65th minute of the match. After three minutes Teixeira made a run from central line of the pitch down the left flank, burst into the penalty area and fired the ball in to make it 3-0. The Pitmen held on to their lead despite all the efforts from the Turkish teams to change something on the football pitch. The hosts also did not convert a few more good opportunities to extend the lead. The visitors were reduced to ten men after Kjaer’s second yellow card. Shakhtar got a big 3-0 win over Fenerbahce to reach the Champions League play-off round. The Pitmen’s opponents will be revealed this Friday.